The Snow Canyon State Park lava caves are one of the most unique sights to behold in Southern Utah. This prominent place is home to an abundance of geological features and historical artifacts. Explore inside the lava tubes or marvel at the Petrified Dunes trail. Learn about the park’s intriguing past by visiting one of the four ancient petroglyph sites. Just slightly over an hour away from most of our Family Time Vacation Rentals, the park is the perfect place for a day trip with the family. 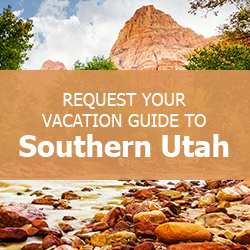 To learn more about Snow Canyon State Park lava caves and other nearby parks, download our complimentary Southern Utah Vacation Guide! Packed with local insight, this guide is the perfect travel companion. Use it as a reference for the best parks to visit, outdoor activities, and restaurants in the area. Though many people visit the state park to see the unusual lava caves, there are so many other sites, trails, and activities to take advantage of. After you’ve explored the lava tubes and witnessed the lava fields, venture to these other areas of the park. A lava tube is formed when molten lava flows from an erupting volcano. When a tube is extinct, it means that the volcano is no longer active and the lava has hardened, creating an elongated tunnel. These lava tubes in Southern Utah froze long ago, forming caves that people can enter and explore. To get to the Snow Canyon State Park lava caves, follow the Lava Flow Trail. This 1.7-mile round trip path is considered relatively easy, so the whole family can enjoy this excursion. Kids will love seeing the many lava tubes that exist along the route. Two of the tubes are not difficult to access. The biggest one is found where the trail ends right before the valley. You can walk nearly 50 feet into this cave, but it’s quite dark once you enter so be sure to bring a flashlight or light source along with you. If you plan to spend the day hiking through the Snow Canyon State Park lava cave trails, you should trek through some of the other areas as well. Composed of Navajo red and white sandstone, the petrified dunes at the center of the park are an extraordinary sight. Though a trail leads you to the intriguing geological formations, feel free to explore the whole area. With so many astounding natural creations, this section of the park encourages visitors to meander around. When visiting the Snow Canyon State Park lava caves, you’ll want to stay nearby. Our Family Time properties in both Brian Head and Duck Creek Village offer easy access to this park and more. Though it takes just over an hour to get to the state park from either town, Brian Head and Duck Creek Village are also close to other national and state parks. Renting one of our homes near national parks is essential if you want to explore as much of Southern Utah as possible on your trip! Check out the Snow Plow two-bedroom condo with a loft, which has sleeping accommodations for up to six guests. Whether you plan to visit Brian Head in the winter or summer, you’ll enjoy beautiful mountain views from the huge living room windows. In the winter, you’re just steps away from the ski trails, and in the summer you can try mountain biking, hiking, or horseback riding.